Students of Stephen Covey or Gordon Graham understand the concepts and relationship between urgency, importance, and frequency. Whether one's duty is managing a project or minimizing risk, the same three issues are constant factors for effectiveness, efficiency, and ultimately...success. Police officers are risk managers. They mitigate threats to protect property and human life. They write incident reports to defend against claims of injustice. They explain and justify their actions to prevent embarrassment or misunderstanding from the community. They develop policies and procedures to reduce civil liabilities and financial exposure. They train to safely perform dangerous tasks and acts. Police officers recognize risks, and then, they make decisions and take actions to manage those risks. It's a delicate balancing act for police officers to operate in this environment where risk is largely unavoidable and unpreventable. Risk is always present. There are ways to reduce these hazards. But first, one must understand the relationship between three factors of a situation: urgency, importance, and frequency. Urgency relates to the timeliness of a needed response. A situation that is not urgent is said to have high discretionary time...or a longer time until a decision or action is required. A situation that is urgent requires an immediate decision or action (low discretionary time)...with little time to consider options or repercussions. Stopping an approaching train while a stalled car is on the track is urgent. Writing the report after the collision of the train with the car is not urgent. Cleaning up the crash site falls somewhere in between. Situations that are urgent have increased risk because humans tend to make less accurate, less preferred, less informed decisions when the time to make that decision is compressed. Importance is the significance or consequences of the situation. The importance can also be equated to overall risk, such as the threat to life, the threat to property, or the potential for some other loss. A situation's importance can be ranked by the level of overall danger, chances of failure, or potential loss as compared to each other possible situation. A choice in which college to attend is more important than what to order for dinner at a restaurant. Likewise, crimes against property are deemed less important than crimes against persons or human life. A violent man armed with a knife is probably less important than one armed with a firearm. Situations that are important have increased risk because the consequences of failure are higher, more profound, or more impactful. Frequency relates to the regularity or chances of the situation occurring. If a given problem or situation happens often, then it's frequent. If the chances of occurring are rare, then the situation is infrequent. When rolling two dice, the chances of rolling two 6s is 1-in-36; the chances of rolling a sum of seven is 1-in-6. Situations with low frequency have increased risk because humans are not as practiced in analyzing the situations or making the decisions as they are in those situations that occur more frequently. Therefore, mistakes are more likely when confronted with a strange or unique problem than with a regular or ordinary one. These three variables of Urgency, Importance, and Frequency can be theoretically put into a three-dimensional space with x-, y-, and z- coordinates. For ultimate simplicity, each component can be quantified as being either "high" or "low." The situation with the lowest level of overall risk is that which combines a low urgency, low importance, high frequency problem. These problems allow a lot of time to make a decision, with plenty of practice and experience, and with relatively little repercussion if the decision or action is wrong. It's like ordering breakfast at a diner. The highest risk situations combine high urgency, high importance, and low frequency. Decision makers are required to take immediate action, with high stakes, with little or no experience or practice. These are unfavorable circumstances in which to find oneself. Bad things happen here. To some extent, each of these three variables can be manipulated. Actions or situations that increase frequency, reduce importance, or reduce urgency are steps that reduce overall risk. Urgency relates to time. When the decision-maker has more time in which to make the decision, one can assume a better or more accurate choice. So how to increase the available time? Slow down physical movement. Or increase physical distance from the problem. In policing, when officers move quickly (like in a fast-paced, dynamic drug raid), the officers decrease the time to analyze the situation, consider options, and make choices. Conversely, when police officers keep their distance or maintain a containment, the time available to gather and process information goes up. In many cases, police officers have control over the clock. In the case of active killer incidents or acts of terrorism, they do not. In these situations, there is a strong correlation between urgency and importance. Speed matters. The Force Science Institute (R) studies police use of force as well as memory and recollection issues regarding critical incidents. They contend that TIME is a major factor in accuracy and clarity in memory. This translates into interviews of officers and witnesses involved in deadly force situations. Contemporary practice is to allow these witnesses and officers to use time to help recall images and events. Report writing and interviews should be considered a non-urgent task. Importance relates to consequences. The actors in a situation can affect the importance of a situation or outcome. Think automobile seat belts - when the driver wears one, the consequences of a car crash decrease. When police officers wear body armor or helmets, the importance of a gunshot wound to those protected areas decreases. In the case of active killer response by school officials, they may elect to call for a lockdown. A lockdown is one way to cut off a killer from his/her future victims...making the at-large killer less effective....making the situation less important (in a quantitative way). There are many steps one can take to reduce the importance of a situation. Some of these can be done in pre-incident policy and design (such as always wearing your seatbelt); some of these can be done in early stages of a potential problem (evacuation of potential victims, properly prioritizing life safety issues). Higher frequency often results in lower risk. To increase frequency, decision-makers can undergo scenario-based training or other tactical decision games. When done correctly, this artificial inflation of frequency has been shown to be as effective as experiencing an actual event! Practice. Practice. Practice. The variables of Urgency, Importance, and Frequency combine to form a three-dimensional depiction of RISK. Police officers need to analyze these factors to determine if changes can be made to policy, training, procedures, decision-making guidelines, or evaluation systems. Changes to these factors can significantly reduce the potential for bad outcomes - whether they be injury, civil litigation, financial costs, or embarrassment. 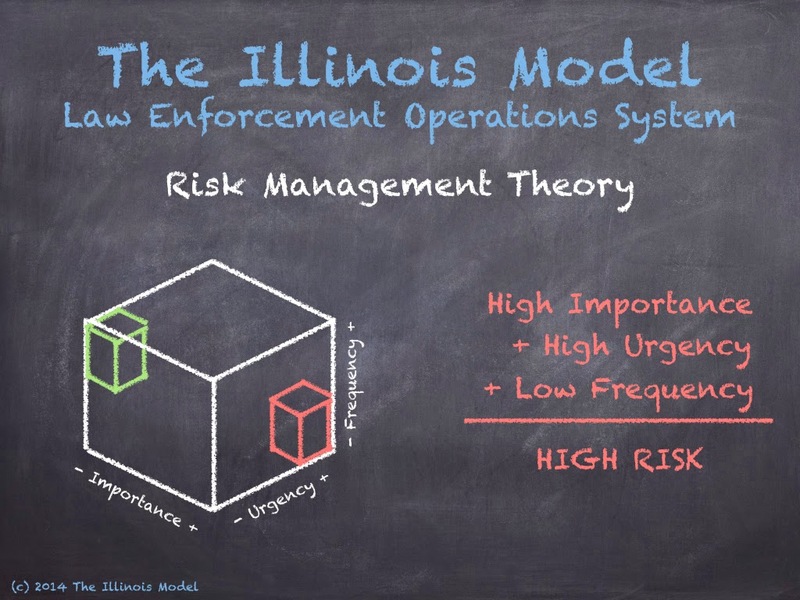 Managing risk allows police officers and agencies to be more effective, more efficient, and more successful. And those are things that are important, urgent, and what I'd like to experience quite frequently.